About a month ago I got one of the best mail days ever thanks in part to Influenster! 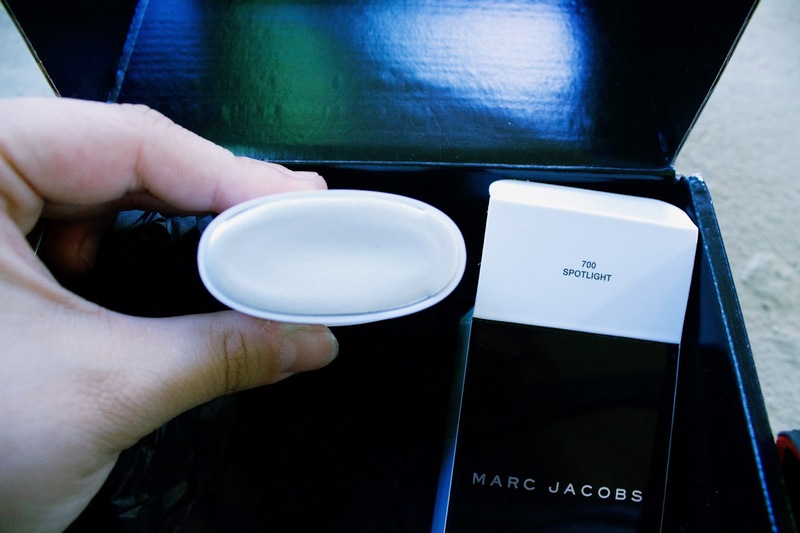 Although it was just one small (slightly beaten up) black box emblazoned with the perpetually chic Marc Jacobs logo, it was enough to make me smile from ear to ear. It was everything I could do to snap this picture before ripping through the packaging and excitedly unearthing the contents. I heard a bevy of reviews and buzz surrounding the Marc Jacobs Glow Stick Glistening Illuminator for a few weeks before receiving my own and was thoroughly thrilled I was afforded the opportunity to sample it myself. I comes in a unique stick, resembling that of another beauty staple - deodorant. However, I find the Glow Stick packaging to be mildly ingenious since it easily protects the product and is compact enough to store effortlessly. This product certainly won't make for a bulky addition to your makeup bag, so don't fear! The surface area of the product is also just wide enough to accommodate the swipe of a finger, which is ideal. This shade of highlighter is touted as being "universal" and I would cautiously agree. Upon initial inspection, it appears quite frosty white. It is only after applying that you can get a true sense of how beautifully subtle and dimensional this highlight shade is. I honestly think it would look completely gorgeous on a very wide array of skin tones! This highlighter offers the perfect wearable everyday glow and refrains from being glittery or sparkly. You can build this product up for a more intense finish, but I found that the more I tried to layer the product, the more chunky it ultimately became and started to look like it was sitting on the skin. One or two thinly applied layers give off a more appealing look that sinks beautifully into the skin and just looks naturally radiant in my opinion. This highlighter is definitely not the one you should reach for if you're looking for a beaming highlight that can reach outer space. I feel like this highlighter is meant to act as a chic sheen for the every girl. You can get a good sense of how it reflects natural light below. 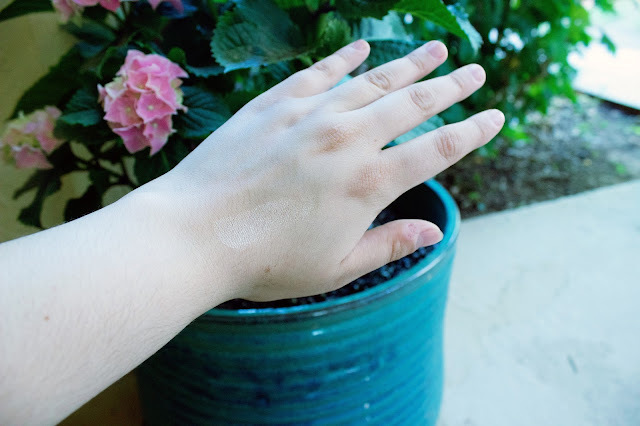 As far as application goes, I find it easiest to apply with clean fingers (patting to blend out on the top of the cheek bones, inner corner of the eyes, cupids bow, nose, brown bone, etc) or with a damp beauty sponge. I would not recommend applying the product from the stick to your face directly for obvious reasons such as messy application and hygiene. My only real "beef" with the product, if you will, is the smell. Though it is not reminiscent of perfume or chemicals, there is a distinct smell to the product that I can only describe as plastic-like. 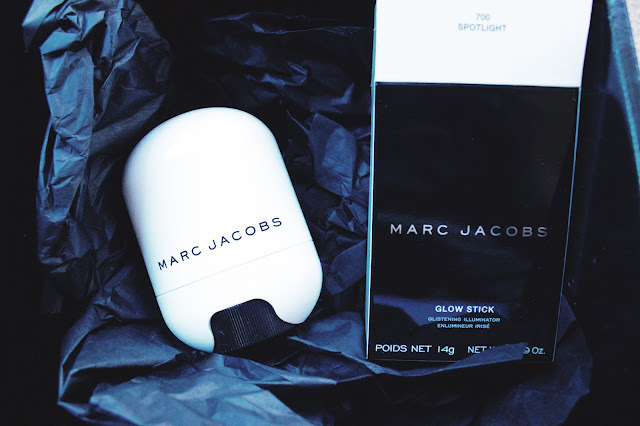 The plasticky smell reminds me of a more cheaply made highlight, which is increasingly off-putting since a Marc Jacobs Glow Stick will set you back a cool $42. I recognize that this smell may not be derived from the product itself, but may be developed from being incased in it's plastic packaging. Regardless, I expected perhaps a bit more from such a high end highlighter. Luckily, the smell does not linger after application and if you are not affected or swayed by smell, it should not effect your view on the product. Overall, I'd say this is a gorgeous everyday highlighter and if you're looking for a higher end option that won't run out quickly, then this is a great one to consider. It's compact, easy to use, and very versatile. I can see it being a staple in such a wide variety of beauty collections. However, if it seems a bit too pricey, I feel confident you can achieve similar results with something more budget friendly for sure.